When Nick Mininno made the Tampa Bay Jr. Lightning Mite Travel Team recently it’s as if the 7-year-old scored two goals in one. He not only gets to become a member of the team, but he also gets to train at the Tampa Bay Skating Academy in Oldsmar – the new official home of the Tampa Jr. Lightning Hockey Club. At left, Nick Mininno, 7, and his dad, Jim. Just like his dad, Nick enjoys playing hockey at TBSA, too. “We get to have fun and shoot on goalies,” he says, smiling. The Mininnos aren’t the only ones excited about the Jr. Lightning organization moving to TBSA. Boys and girls ranging in ages from 8 to 18 can try out to be a part of the Jr. 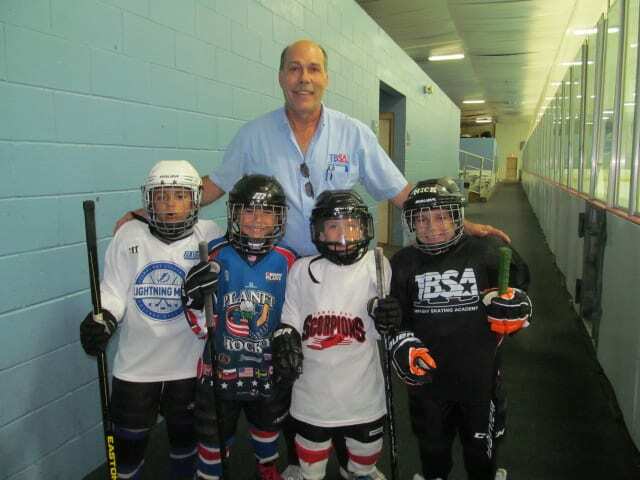 Lightning club, one of Tampa’s top youth hockey organizations. For more than 20 years, the club operated out of Clearwater Ice Arena, which only has one sheet of ice. Garr says there were several reasons that prompted the organization to move the youth hockey program to TBSA, which has two full-size rinks. While the Jr. Lightning organization will continue to be self-governered, the partnership with TBSA is a team effort designed to encourage and prepare youth hockey players as they advance from the learn-to-skate programs and the instructional and recreational hockey programs to the A and AA travel teams. Jr. Lightning Mite Travel Team. Al Nicoll, TBSA’s hockey director, is pleased the Jr. Lightning club has joined forces with the rink. “They’re getting involved in our in-house program, coaching clinics and mentoring programs, so we can do better training to get the kids ready to play travel hockey,” he says. As Nick continues to play hockey throughout his childhood, he may not remember the day he made the Mite travel team. But he definitely remembers the day about 2 1/2 years ago when his interest in hockey was first piqued. There’s little doubt hockey will continue to be a bond he and his dad will share for years to come – at the Tampa Bay Skating Academy in Oldsmar.